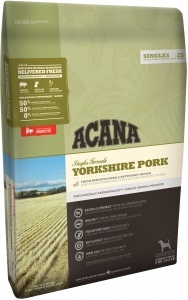 ACANA Yorkshire Pork dog food contains 50% pork - a single protein source which is easy to digest. This makes it ideal for diet-sensitive dogs of all breeds and ages. Raised on local prairie farms, the fresh Yorkshire Pork arrives in nourishing WholePrey ratios of meat, organs and cartilage which mirror the natural diet. Fresh squash and pumpkin support healthy digestion. Prepared from the best and freshest ingredients in award-winning kitchens, this Biologically Appropriate food is perfect for fussy or diet-sensitive dogs. Fresh yorkshire pork (16%); pork meat meal (16%); whole green peas; whole red lentils; fresh pork liver (6%); pork fat (6%); fresh pork kidney (4%); fresh whole butternut squash (4%); whole garbanzo beans; whole green lentils; whole yellow peas; dried pork cartilage (2%); lentil fiber; marine algae (1.2%) (pure and sustainable source of DHA and EPA); fresh whole pumpkin; dried brown kelp; freeze-dried pork liver (0.1%); salt; fresh whole cranberries; fresh whole blueberries; chicory root; turmeric root; milk thistle; burdock root; lavender; marshmallow root; rosehips; enterococcus faecium. Ultra premium grain-free dog food. 50% Pork. 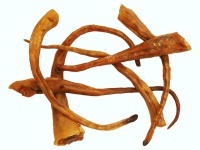 Air dried pig tails. Healthy natural dog chew.